A couple weeks ago, the N.Y. Times published an addictive precinct-level map of results from the 2016 presidential election. Statewide, California voters resoundingly favored Hillary Clinton, giving her 61.5 percent of the vote to Donald Trump’s 31.5 percent. But viewed in granular detail, the Times map powerfully demonstrated how many of us really do live in electoral bubbles. The N.Y. Times map gave little doubt about the Bay Area's presidential preference in the 2016 election. 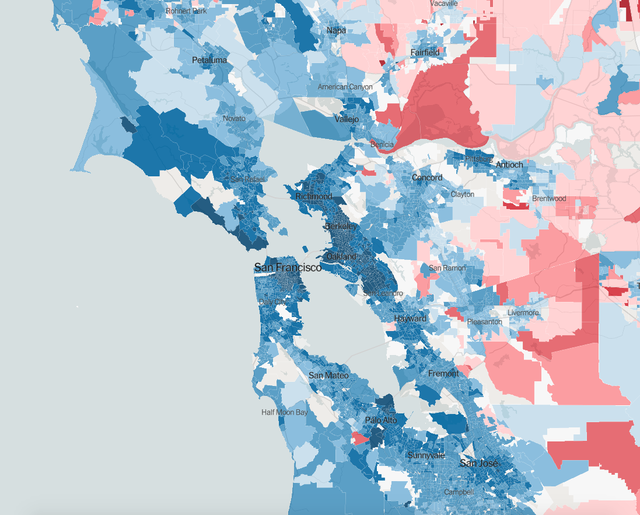 Trump was crushed in the Los Angeles and San Francisco regions, together home to roughly 60 percent of California’s population. By one analysis, the Bay Area voted in favor of Clinton by the largest margin of any American metro. In Berkeley, Trump actually came in third, behind the Green Party’s Jill Stein. The Times map showed Los Angeles proper, a place with more people than nearly half of all U.S. states, slathered almost entirely in blue, then fading to pink and peach only at the fringes in places like Simi Valley, Santa Clarita, and Yorba Linda. Los Angeles was a bastion of blue. Still, some lonely splotches of pink appear in the heart of both Democratic metropolises. One is situated improbably just west of Palo Alto, in the middle of liberal Silicon Valley. Zoom in and you realize why: It’s populated by little more than a few horse farms. Trump won the precinct by 15 votes to five. Two other Trump islands can be spied less than 10 miles from downtown Los Angeles. They encompass ultra exclusive neighborhoods in Beverly Hills, home to both celebrities and titans of capitalism like the hedge funder and Republican donor Mitch Julis. Clockwise from top left, Stockton, Modesto, Bakersfield, and Fresno. The San Joaquin Valley cities voted largely for Hillary Clinton in 2016. Vast swaths of California’s agricultural heartland are shaded in red. Indeed, many Central Valley counties landed in the Trump column on Election Day. But others didn’t. That's thanks in part to the cities along Route 99 — including Stockton, Modesto, and Fresno — which appear as islands of blue in a sea of red. Among the most mixed of the agricultural cities appears to be Bakersfield, the seat of Kern County, which gave Trump 53 percent of its vote compared to 40 percent for Clinton. Robert Price, a columnist at the Bakersfield Californian, said the city of 350,000 people is California’s most conservative metropolis. “That's my conclusion, anyway, now that Orange County has started electing Democrats,” he said in an email. Price said that while Bakersfield has no small number of liberals — especially in the lower-income southeast sections — the city’s geographic isolation has played a part in cementing a unique brand of conservative politics. “We're kind of stewing in our own juices,” he said. The area around San Luis Obispo County introduced a reddish interlude along a mostly blue coast. Along California’s coast, every county went to Clinton aside from one: the northernmost, Del Norte. At the precinct level, however, the picture is more varied. 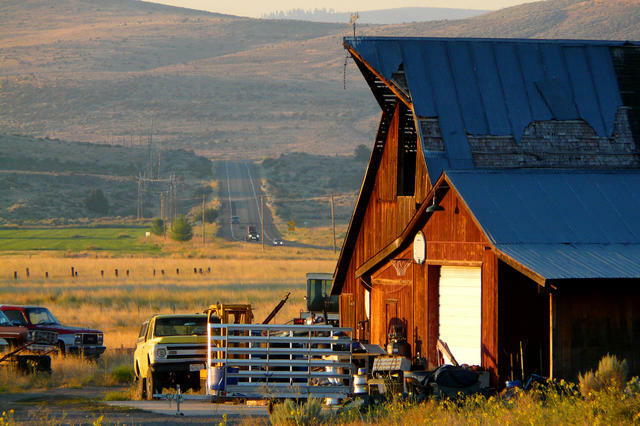 Starting from around Petrolia in Humboldt County, the blue coast proceeds south largely uninterrupted before colliding with swaths of red in San Luis Obispo County, an area with strong ranching and farming traditions. 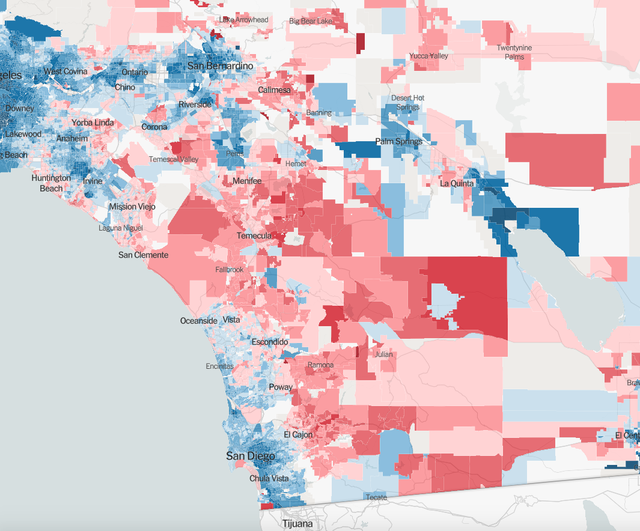 Moving farther south, reds and blues form a patchwork outside of the solidly blue cities of Santa Barbara, Los Angeles, and San Diego. Orange County has experienced an erosion of Republican support. 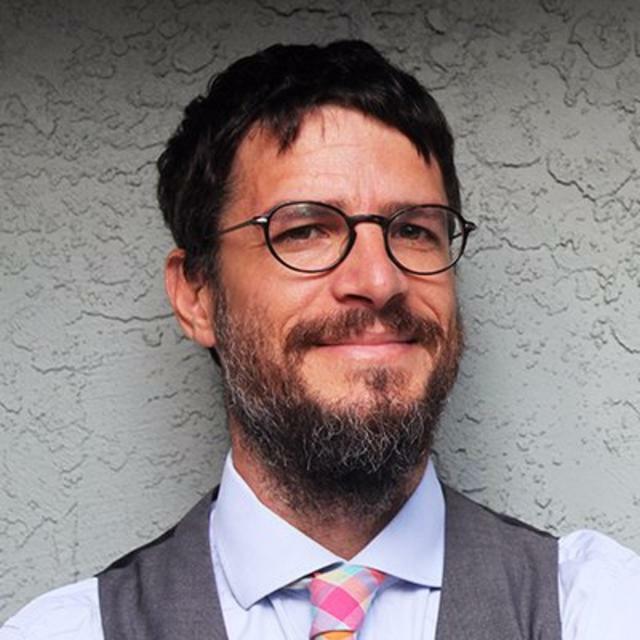 Kousser, the political scientist, said Southern California used to be much more politically mixed. He cited the defense cuts of the early 1990s that resulted in a scattering of Republican voters, along with an influx of immigrants who tended to side with the Democrats. As the Republican Party has drifted further right under Trump, Kousser said, the trend toward more politically monolithic territories has gathered pace. 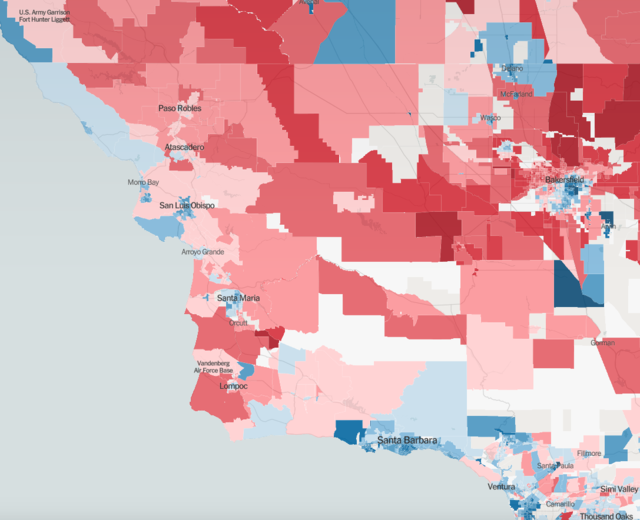 An example is how Orange County, once solidly red, has increasingly matched the blue of its surroundings.